Yesterday, out kayaking with a good friend, in the bay were moored two large yachts. There was a sizable swell, and it was fun paddling, rising and falling with the yachts rising and breaking the horizon, cables ringing in the sea breeze. We paddled close and conversed with one of the sailors. From the Netherlands, they had been sailing around Ireland and the British Isles. 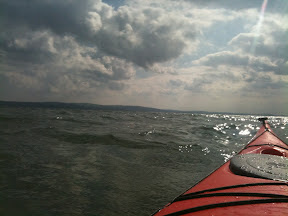 Waiting for that evenings wind, predicted to pick up, next stop the Scots isle of Jura. Telling the guy about my recent visit to Skye in the camper van, he told me about traveling around New-Zealand in a camper. Before paddling on further around the coast, we all agreed, this is the life!